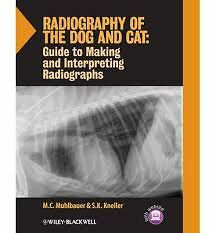 Radiography of the Dog and Cat: Guide to Making and Interpreting Radiographs offers a comprehensive guide to producing high-quality radiographs and evaluating radiographic findings. Equally useful as a quick reference or for more in-depth information on specific diseases and disorders, the book is logically organized into sections describing how to make high-quality radiographs, normal radiographic anatomy, and interpretation of radiographic abnormalities. It is packed with checklists for systematic evaluation, numerous figures and line drawings, and exhaustive lists of differential diagnoses, resulting in an especially practical guide for the radiographic procedures performed in everyday practice. Written in a streamlined, easy-to-read style, the book offers a simple and fresh approach to radiography of the dog and cat, correlating physics, physiology, and pathology. Coverage includes patient positioning, contrast radiography, normal and abnormal radiographic findings, and differential diagnoses as they pertain to musculoskeletal, thoracic, and abdominal structures. Radiography of the Dog and Cat: Guide to Making and Interpreting Radiographs is a one-stop reference for improving the quality and diagnostic yield of radiographs in your clinical practice.